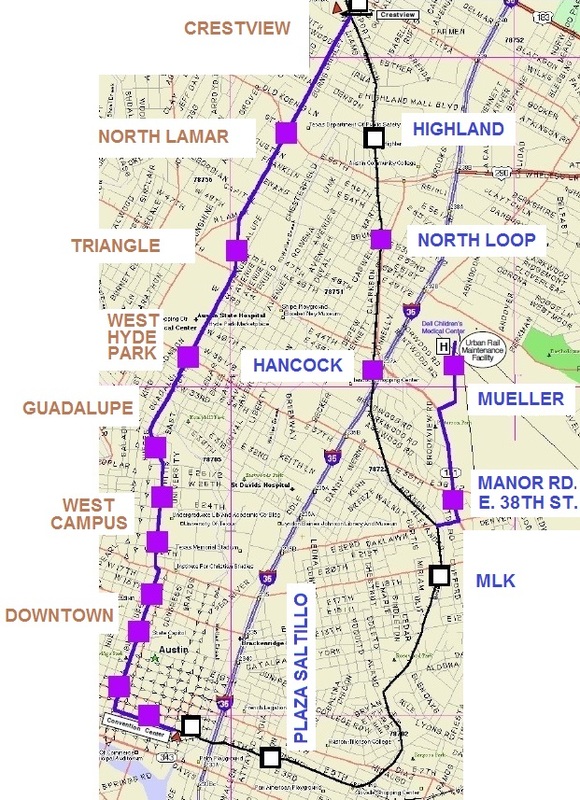 Light rail transit alignment following North Lamar Blvd., Guadalupe St., Riverside Dr., and Pleasant Valley Rd. as proposed by MobilityATX. 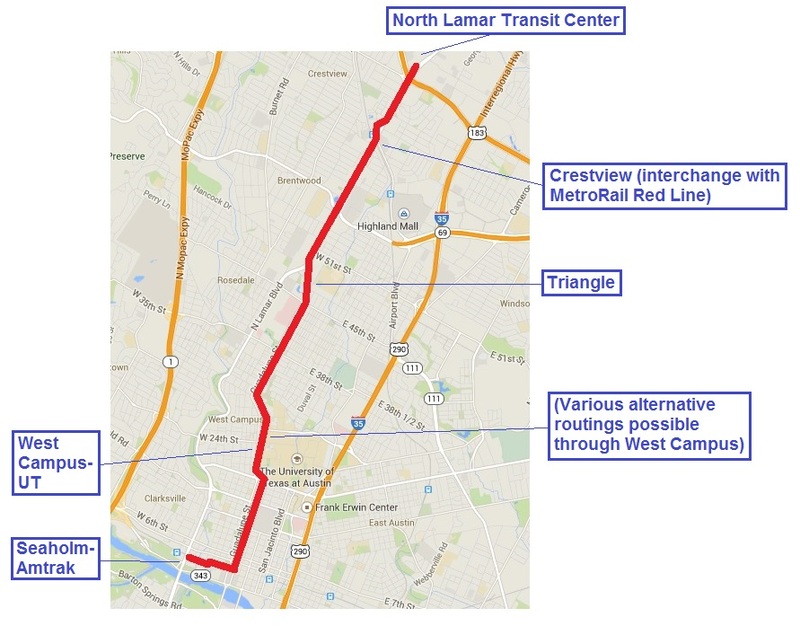 The prospect of a light rail transit (LRT) starter line project in the Guadalupe-Lamar corridor has received another huge boost in a recommendation from MobilityATX, an eminent Austin-focused civic organization that describes itself as “a community-engagement initiative sponsored by both public and private community partners that invites the public to create and shape public policy solutions to Austin’s transportation woes.” The recommendation for Guadalupe-Lamar light rail is included as one of ten “Popular Ideas” resulting from a community input process in the spring and summer of 2015, elaborated in a Mobility ATX Findings Report produced by Glasshouse Policy “in conjunction with community partners and stakeholders …” and packed with supportive factual documentation. The report was originally released in mid-October. 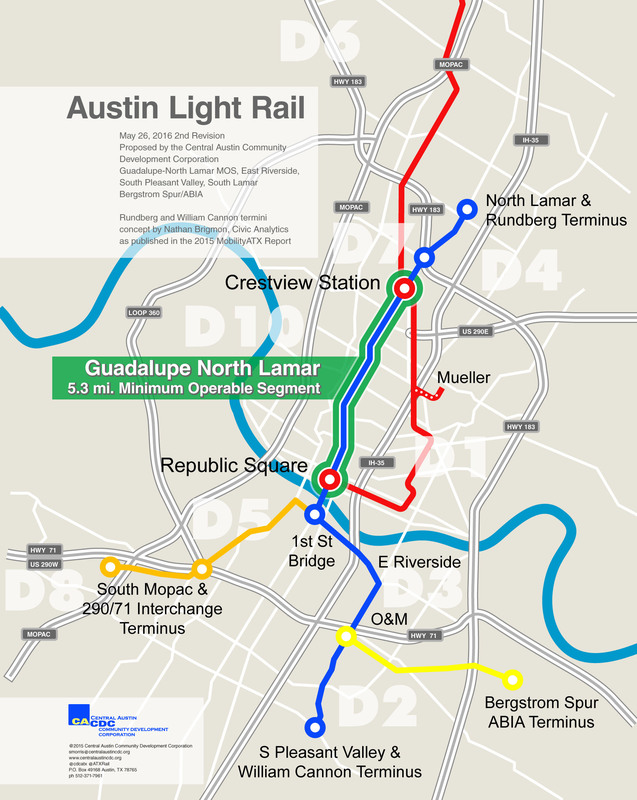 The report’s proposed LRT alignment, shown in its map at the top of this post (see above), includes the Guadalupe-Lamar segment (which we’ve consistently advocated as the most feasible LRT starter line), then crosses Lady Bird Lake (the Colorado River) to include a possible line branching into southeast Austin. The proposed route follows North Lamar Blvd. and Guadalupe St. (and presumably the Guadalupe-Lavaca street pair downtown), then crosses the river via a bridge that appears to be roughly located parallel to either the South First St. (Drake) Bridge, or the Congress Avenue Bridge — or possibly it involves an adaptation of either bridge to include lanes for LRT (as we’ve also proposed). Heading southeast, the proposed route appears to follow Riverside Drive, then turns southward to follow Pleasant Valley Road and then other unspecified alignments south of Ben White Blvd. (State Highway 71). Population density levels shown on the route map indicate that areas of high density are connected by the alignment. We must get cracking on planning a light-rail line that will serve the greatest number of riders on day one, and going forward. We can’t give up on light rail just because the city floated a bad plan and voters shot that bad plan down. Bus Rapid Transit is not a substitute. Supported by a consortium of leading civic “partners”, including the Downtown Austin Alliance, the Greater Austin Chamber of Commerce, Capital Metro (the region’s transit authority), RECA (the Real Estate Council of Austin), Leadership Austin, the Central Texas Regional Mobility Authority, the Austin Monitor (online news media), and a variety of mainly tech-involved businesses and other organizations, MobilityATX clearly represents much of the top civic leadership of the city. (See complete list of partners in the graphic below, from the Findings Report). Mobility ATX/Glasshouse Policy partners. Graphic: MobilityATX Findings Report. As Austin rapidly evolves, we must continually innovate new approaches to engage Austinites in the discussions that shape City policy. Given the participation in the MobilityATX initiative, it’s clear Austinites are anxious to contribute their ideas for transforming mobility, and how it impacts our commutes, our economy, and our lives. ensure that we hear from all Austinites in every district as we plan for our mobility future. I’d also like to thank the array of public and private stakeholders for their vision and support of this effort, including business, government, and civic leaders like RideScout CEO Joseph Kopser, Dewitt Peart of the Downtown Austin Alliance, and Capital Metro CEO Linda Watson. Each of you who took part in MobilityATX confirmed that all Austinites have something to say and deserve a forum in which to say it. I look forward to working with the MobilityATX partners to ensure Austin leads the global conversation on what constitutes a smarter, more connected city, and continues to reflect the innovators and entrepreneurs that call Austin home. After the defeat of Proposition 1 in November, there has been no significant movement to develop a new light rail plan for Austin. In order to build new light rail in Austin, bond funding would have to be secured for a new plan. There is no official public effort underway to develop a new light rail plan. Austinites are anticipating that city and regional transportation authorities will develop a new plan for a light rail system, a process that should include sustained and inclusive community input in the planning and development of that system. Beyond all other data collected, the expectation of inclusion is most critical to understanding Austin’s evolving mobility constituency. Contact your Council Member. Like the Bicycle Master Plan, building a light rail line requires a bond election. In order for a bond to appear on the ballot, City Council must vote to put that bond proposal up to popular vote. Once City Council does that, a simple majority in a popular election is required to pass the bond proposal. CACDC statement applauding Mobility ATX report, as shown on KEYE-TV News. Screenshot: ATXRail. You are currently browsing the _______________Austin Rail Now blog archives for November, 2015.